Iconic pillars to perfectly symbolize achievements and success. Great for any corporation or business commendations. 7" x 8" x 2 1/8"
8 1/2" x 8 3/4" x 2 1/8"
10" x 9 1/2" x 2 1/8"
The broad, rectangle plaque is made from starphire glass, on top of a 2-tier rubber wood base. Accented by an aluminum column on each side. 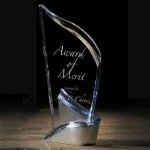 Three Layer 9" Tall acrylic award, available in blue, green or red accent. 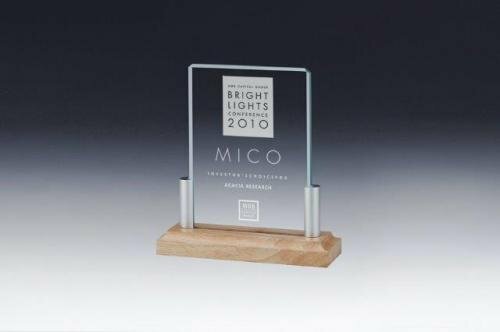 This acrylic award is an excellent choice for almost any award presentation. The Pinion Indigo Award is a dazzling fan-shaped award, containing three floating blue crystal spheres between the two sides and a clear beveled optical crystal base. 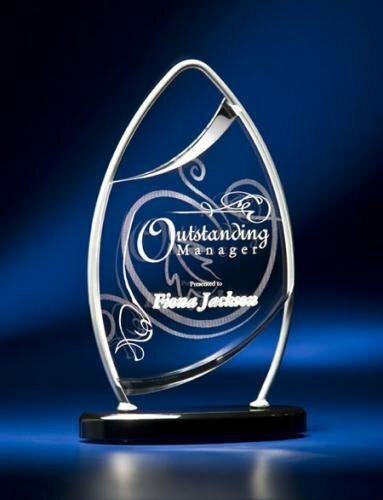 The award can be customized with your personal image or message. The Pinion Indigo Award is available in three sizes. Pinnacle comes with four pinnacle towers strategically lined up and mounted on a heavy black crystal pedestal base. This award should be presented only to your very top performers. Available in five sizes. Pricing does not include engraving, etchings or personalization. Include what you would like on each award; names, logos and additional text. You will receive an Order Acknowledgment via email with any additional pricing. Please see the right hand menu on our website for Engraving Text Ideas. A stunning combination of bent satin finish wire frame holding a stunning acrylic shape angled in the pinnacle resting on a black acrylic base. Full color imprinting available as an optional imprinting method for this acrylic award. Jade Glass Award Pinnacle with Slant Edge Base 3" deep base attached. Cardboard gift box included. Optical Crystal Pioneer Clock Tower. Foamed gift box included. Ridged acrylic flares out in a dramatic fan and is enclosed in a shiny cast metal silver base.